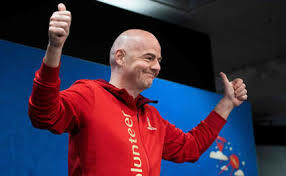 November 9 – Swiss prosecutors have launched an investigation into alleged suspicious links between Gianni Infantino and a senior judicial official who comes from the same area of the country as the FIFA president. Media reports claim Valais prosecutor Rinaldo Arnold facilitated secret meetings between Infantino and Swiss attorney general Michael Lauber whose office has been investigating numerous strands of alleged corruption within FIFA since 2015. The Valais office has now appointed a so-called extraordinary prosecutor to shed light on the relationship between Infantino and Arnold, chief prosecutor in Infantino’s home region of Upper Valais, following claims made by the Football Leaks whistleblowing website. The claims say Arnold, who grew up in the same city as Infantino and is president of sixth division FC Brig-Glis – who Infantino once played for – received invitations to World Cup matches in Russia as well as the FIFA Congress in Mexico in May 2016 and the Champions League Final in Milan that year. Arnold says his relationship with Infantino is entirely private and FIFA insists there has never been any impropriety in its dealings with the attorney general’s office. In a further twist, Lauber has reportedly suspended his chief investigator for economic crimes, Olivier Thormann, whose overall role apparently included criminal proceedings related to football and FIFA investigations. It is unclear why he has been released or the exact nature of the charges against him.